Steve and Naomi are from the paranormal group S.T.U.R.S., which stands for Seeking the Unknown Realm Society. Steve is the founder of S.T.U.R.S. and Naomi is an investigator. The group was started in October of 2010. STURS has investigated many locations throughout New England, including Rolling Hills Asylum in Bethany, NY, The Houghton Mansion in North Adams, MA, The Haunted Victorian in Gardner, MA, The Governors Inn Hampton Falls, NH, The Paine House in Coventry, MA and best known for their appearance on A&E's My Ghost Stories for their story on the investigation of The Seacoast Repertory Theatre in Portsmouth, NH. Steve and Naomi also perform together singing which includes performing live at the 2013 Paranormal Awards and will be once again at the 2014 Paranormal Awards. 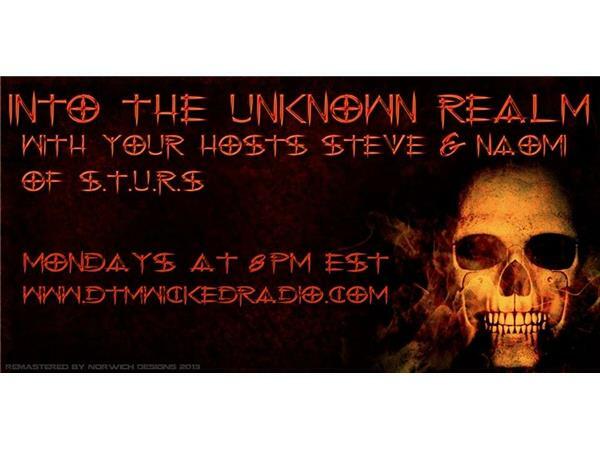 Into The Unknown Realm with Steve & Naomi are norminated for Radio Show of The Year for the 2014 Paranormal awards and STURS was a nominee for the 2013 & 2014 EVP Of The Year Award. Naomi can be also seen in the benefit calendar for 2014 Women of The Paranormal as Miss January. They are often joined by their teammates from STURS, like Steve E, Terri, Brian, Catrina and Dan. Always a fun show filled with some pretty amazing guests! !